A place many of my friends dub as ‘no man’s land’, Punggol in the north-east of Singapore is actually home to many great eats. This includes the well-loved Malaysian street food favourite, lok lok. 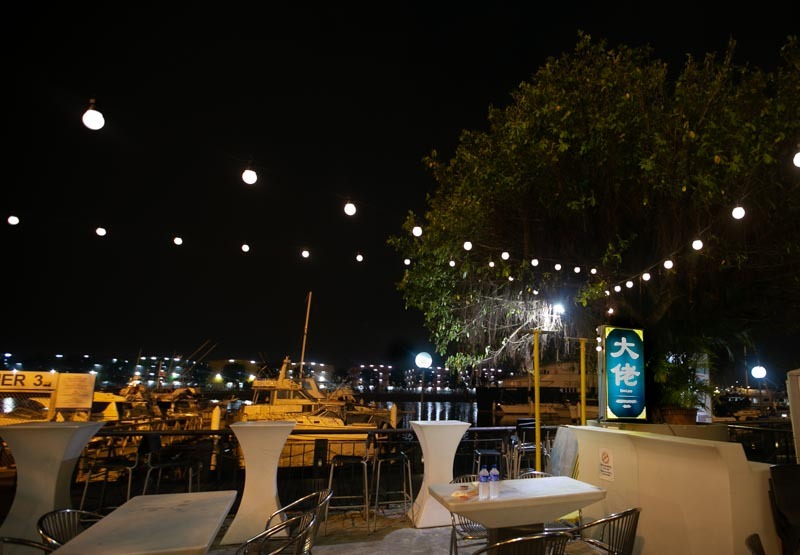 Dai Lou boasts a stunning Punggol waterfront view located at Marina Country Club featuring both traditional and original creations of zi char. 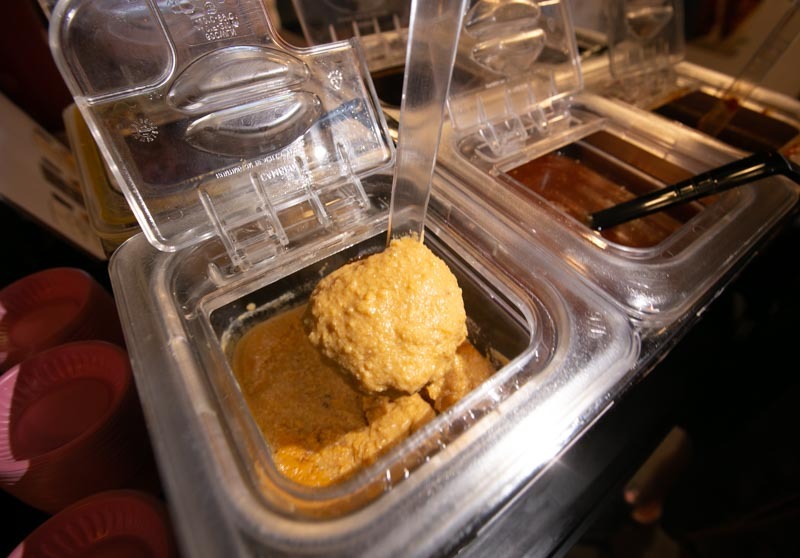 Their newest expansion includes introducing lok lok to their menu. If you’ve been by Punggol Waterfront before, you’ll be able to testify that the area is known for its chill and laid back atmosphere. 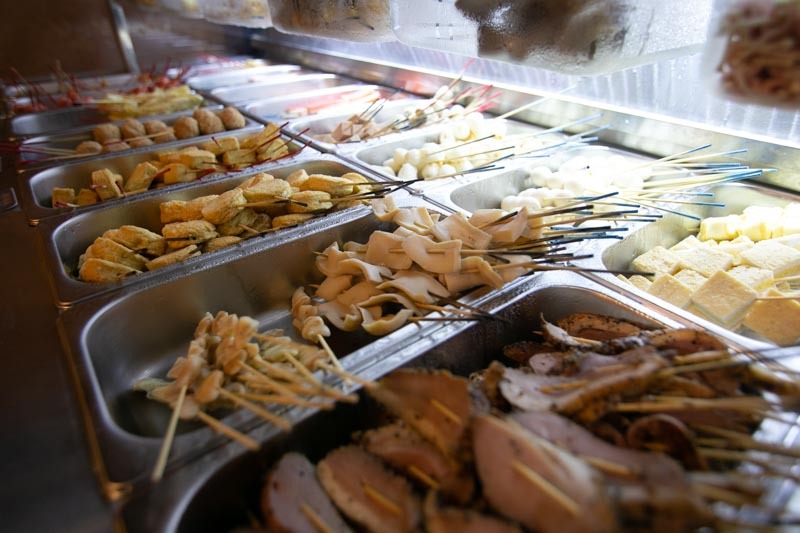 For the uninitiated, lok lok is an icon of JB’s street foods, comprising of skewered foods to be boiled in a steamboat, deep-fried or grilled. 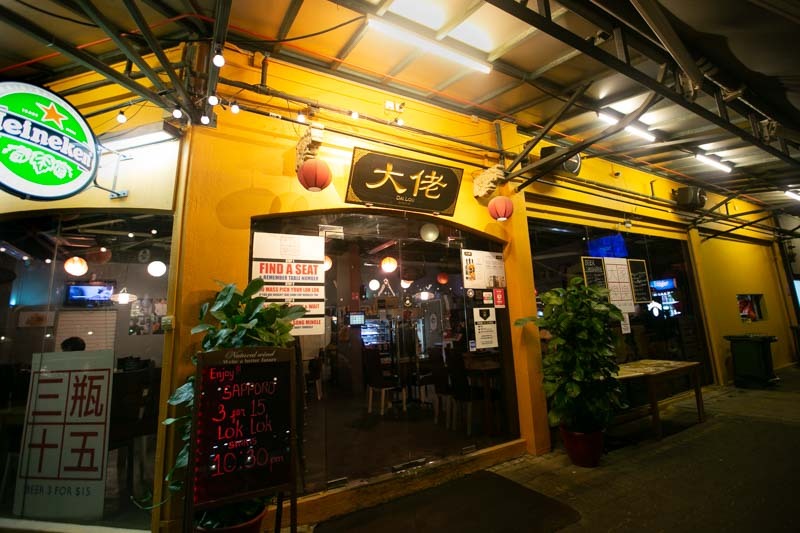 With numerous lok lok stores popping up over the island, many attempt to provide diners with the same authentic JB experience, tastewise. What we wouldn’t get here (thankfully) is sharing soup with random customers from one common pot, something unique to the lok lok of JB. Their namesake ‘Dai Lou’ (Cantonese for a big boss) draws inspiration from gangs seen in classic Hong Kong action movies. Like how the ‘dai lou’ takes care of his men, the head chef of Dai Lou does the same for his diners. So unlike most or all lok lok outlets in Singapore where you do the boiling, grilling and deep-frying on your own, all you’ve got to do is to mass pick your lok lok, pay and wait to be served. That also means Dai Lou defies another convention of lok lok, which is to typically have soup bases in front of you to boil your food. 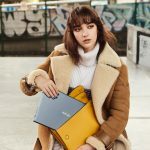 You won’t be needing that at Dai Lou since almost everything is done for you. 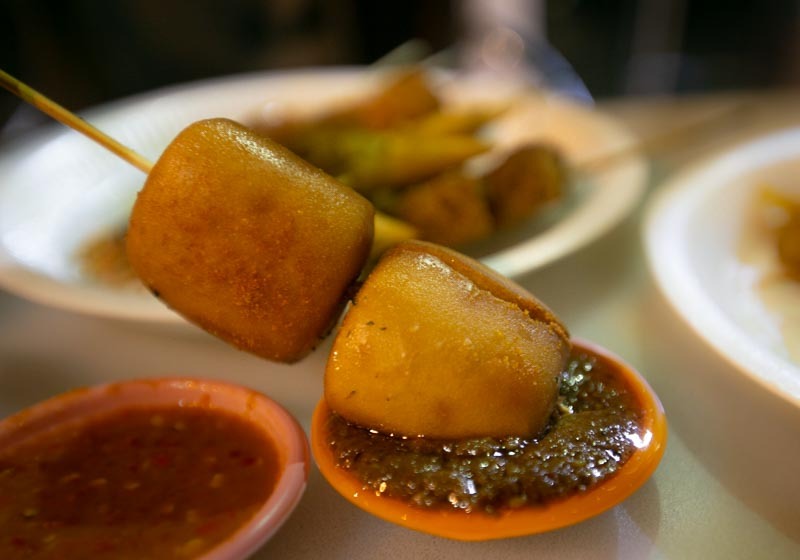 Prices begin from as low as S$0.50 per skewer like their Corn Cob and Lady’s Finger. 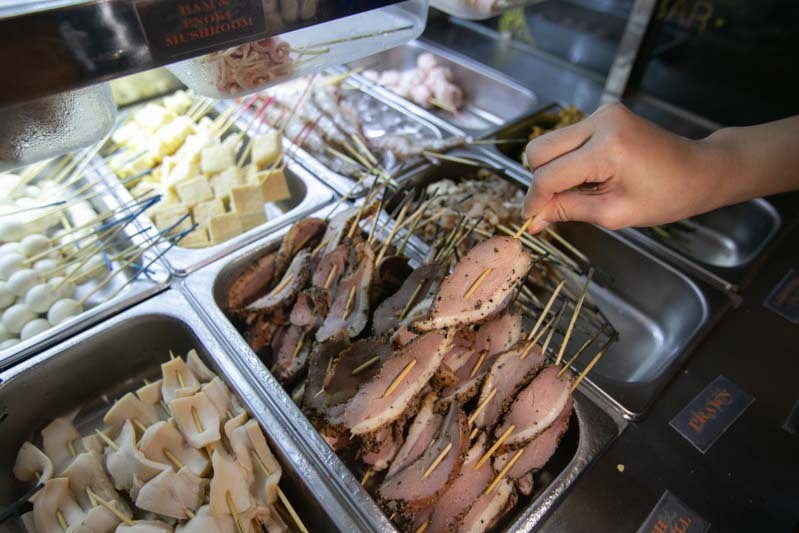 Each stick is colour coded at the end of the stick, indicating the prices of either S$0.50, S$1, S$1.50 or S$2. Naturally, meat and seafood lean to the costlier side. We were quite surprised when one of the owners told us that their Broccoli (S$1) was actually one of their best-sellers. It’s one vegetable that has gained quite an undeserved bad rap amongst many, but it’s likely they haven’t had it roasted or grilled before. 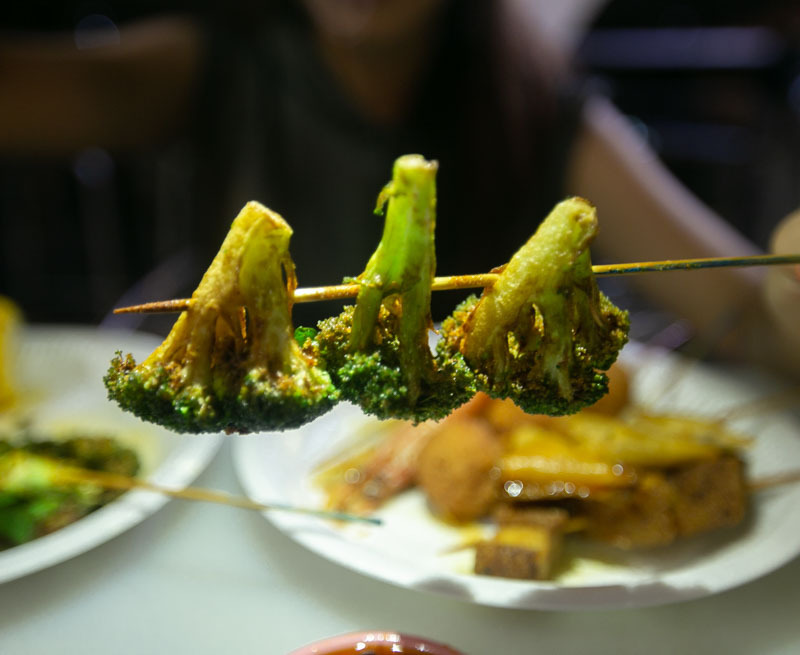 The grilled broccoli we had definitely lived up to its popularity, delivering a sweet, nutty and toasty flavour which made it rather addictive. Since lok lok is very much about the dipping sauces, we were quite disappointed that there weren’t as many to choose from. Apart from picking out our food, the sauces were the only other part of the meal that needed self-service. Their sambal, salted egg and satay sauce stood out amongst the six sauces available. 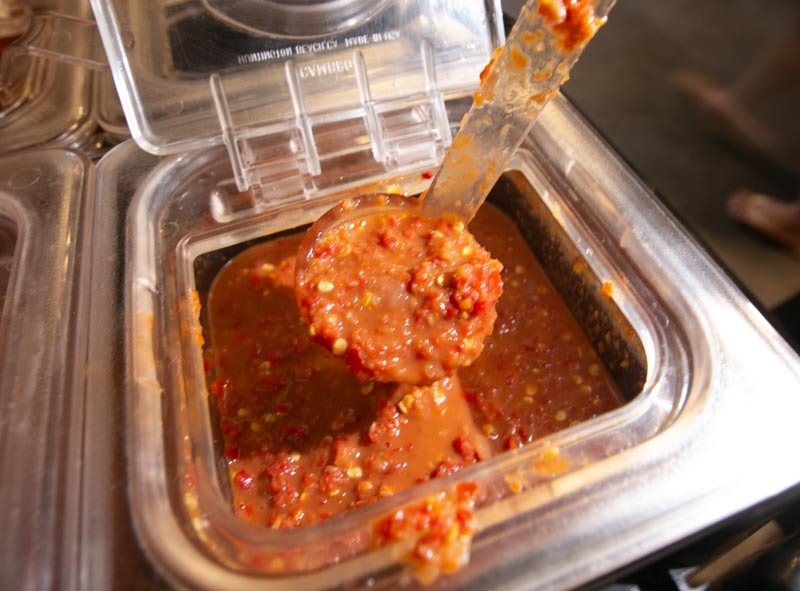 We unanimously agreed that the sambal complemented almost every ingredient, likening it to the chilli you get to go with your BBQ wings â a little tangy from the lime with just enough kick and numbness from the chilli. Unpopular opinion: salted egg anything isn’t all that great. I say this with much disappointment from trying the countless attempts of incorporating salted egg into everything while the trend lasted. Some were good, others were mediocre. Most of it didn’t appeal to me, mainly being too overwhelming and jelak to finish. Needless to say, I was not expecting a lot when I tried their Salted Egg Sauce. Admittedly, it didn’t look the most appetising; lumpy and of a thick consistency. 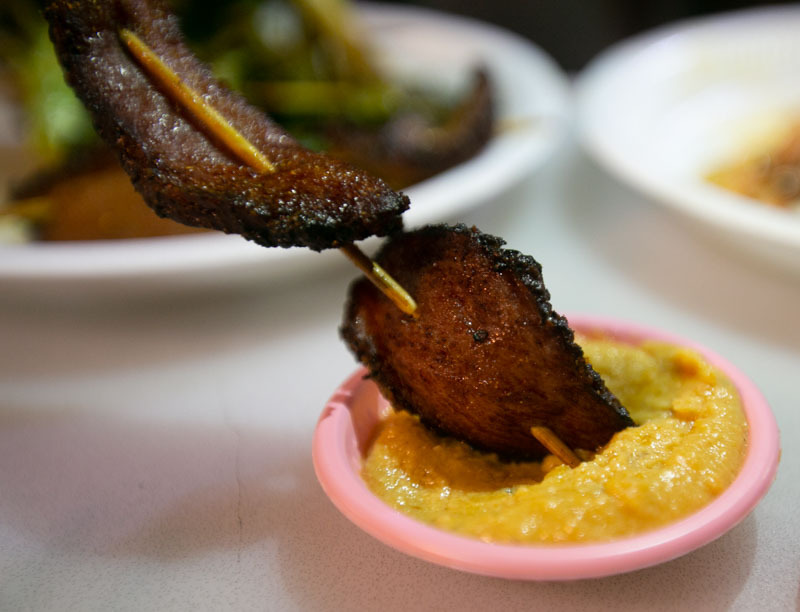 But dipping my duck skewer into it, it was just the right amount of saltiness and there was even a grainy texture, characteristic of salted egg. 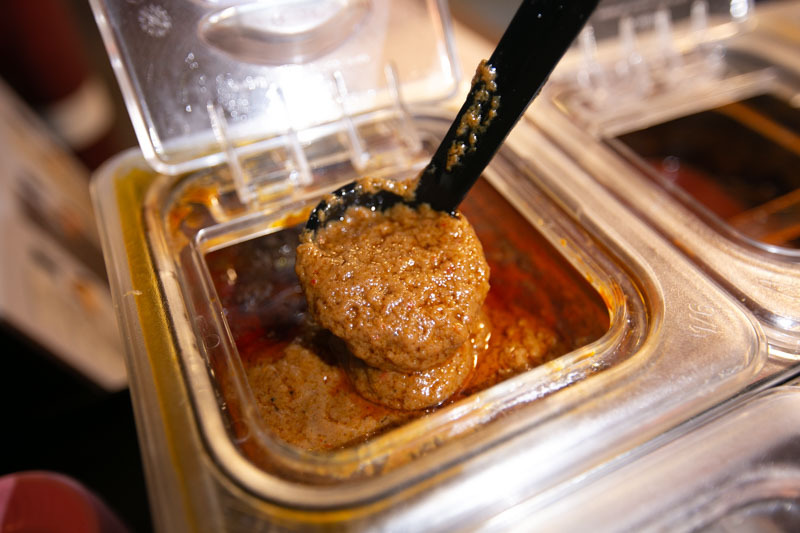 We agreed it wasn’t an overwhelming sort of sauce, which meant you could go for several dips without getting tired of it. 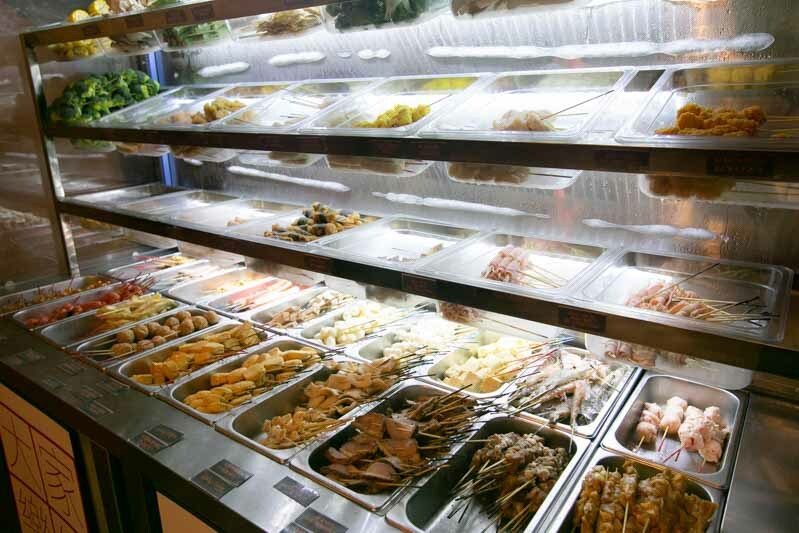 Quite expectedly, seafood is priced the highest on the list at S$2. We got our share of prawns and clams. 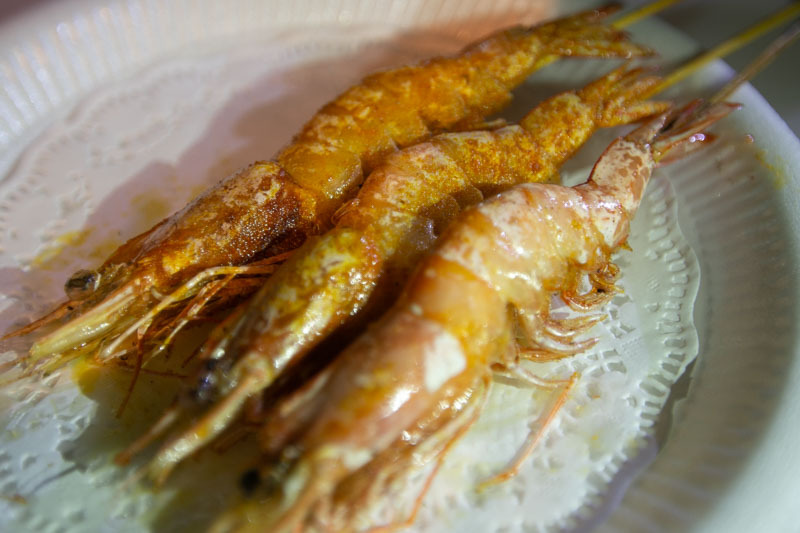 Since only the exterior of the prawns was peppered with seasoning, the actual flesh, though firm, did not have much flavour. I suppose this is where the sauces do their magic. 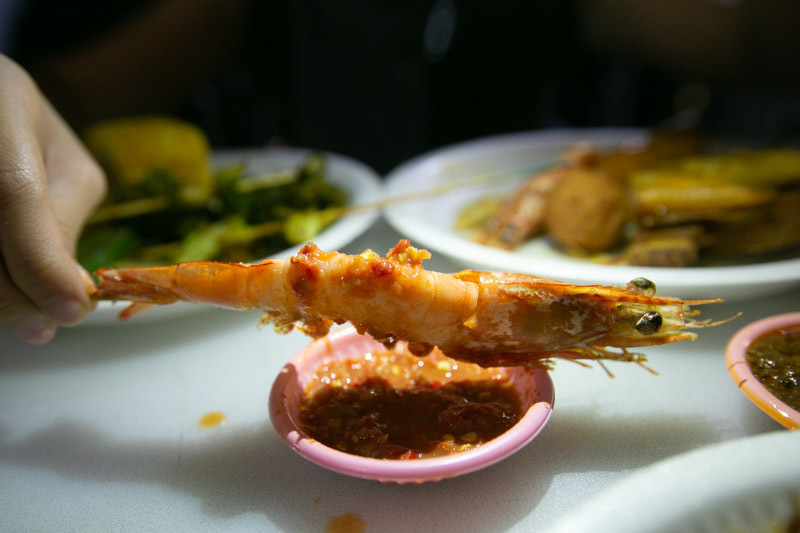 Dipping the prawn in the sambal definitely did wonders in elevating the taste. For those of you who cannot go without hum (cockles) in your laksa, you’ll be glad to know Cockles (S$2) are served by the plate here. Any local would rave over chilli crab and its mandatory side of fried mantou to go with the sweet and spicy sauce. Binging on the crispy deep-fried mantou dipped in sauce sure is a guilty pleasure of mine. Since we do not get to choose how our ingredients were prepared, it only seemed appropriate that the Mantous (S$1) we picked were going to be deep-fried. Thankfully, they came back to us a deep golden shade, crispy and buttery, but still retaining that soft inside. I could eat it on its own, but it went best with the satay sauce where the peanuts added a nutty fragrance. 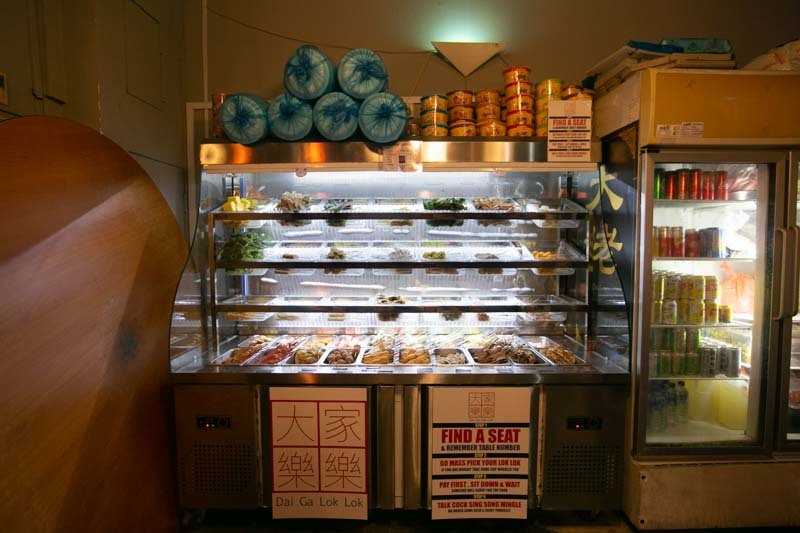 If you’re adamant about having JB-style lok lok in Singapore, then perhaps Dai Lou wouldn’t make the cut. But for a chill supper place with food that goes amazingly well with chilled beers, it’s definitely a go-to. Fridays would be the best time to go, with their affordable three for S$15 offer on Sapporo bottles.